Ever since the 9th century, when the Abbaye de Sainte-Opportune first recognised the potential of the vast marshes northeast of Île de la Cité to be drained and transformed into arable fields, the part of Paris we now know as the Marais has been a land of opportunity. French kings have looked to the Marais to stretch their legs at countryside retreats, from Charles V in the 14th century to Henri IV, who ignited a real-estate boom in the early 17th century by setting up residence around today’s Place des Vosges. In the 19th and 20th centuries the Marais welcomed immigrants from eastern Europe and beyond, who turned the neighbourhood into a commercial district. In recent decades, it has seen one provocative gallery or trend-setting concept store after another pop-up, earning it a reputation as a launch pad for start-ups. 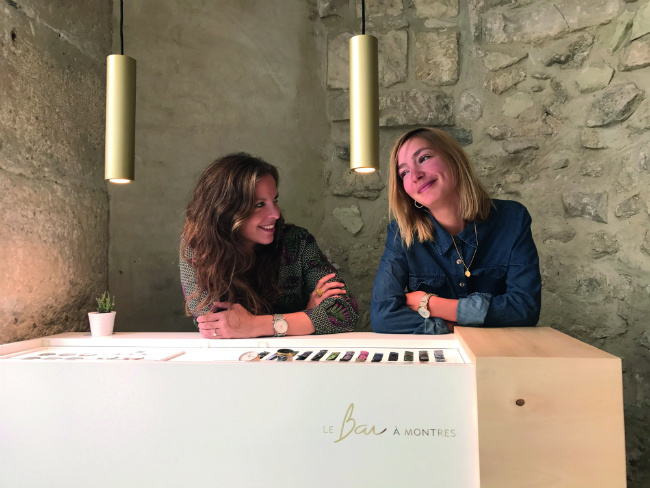 So, when Audrey Paul and Cindy Guerreiro decided to leave their jobs at a Paris fashion agency to launch their own Made in France watch brand in 2016, they naturally looked to the Marais to find a space for their flagship workshop boutique. “We have always seen the Marais as a neighbourhood where you can find innovations, new brands, and fresh talent, so we wanted our new business to be associated with that,” says Audrey. “The problem is, in the heart of the neighbourhood, that’s starting to no longer be possible.” From rue Vieille du Temple to rue des Francs-Bourgeois rents have sky-rocketed, and it’s becoming more common to find multinational luxury brands than independent boutiques and artisans. As the women widened their search, they began looking south, toward an altogether different part of the Marais: the quartier Saint-Paul. With rue Saint-Paul down its centre, rue Saint-Antoine and the Seine to the north and south, and rue du Petit-Musc and rue des Nonnains-d’Hyères to the east and west, the quartier Saint-Paul has 17th-century classical architecture, heaps of medieval character, a maze of alleys and passages, and a unique series of interconnected courtyards known as the Village Saint-Paul. 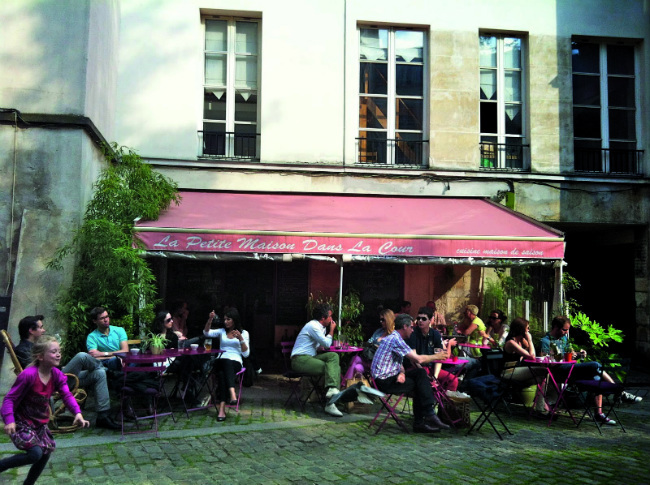 The rest of the Marais has heritage too, but the quartier Saint-Paul distinguishes itself by its laid-back ambience, owed in part to the independent antiques dealers, artisans and artists who work here. Of course, the quartier Saint-Paul is far from frozen; indeed, the opening of Laruze is just one herald of a wider evolution underway here, as a small wave of new, independent businesses has come to the street in the recent years – from the delightful Franco-Japanese chocolate shop Les Trois Chocolats at No. 45 to the renowned far-eastern antiques specialist Galerie Slim Bouchoucha at No. 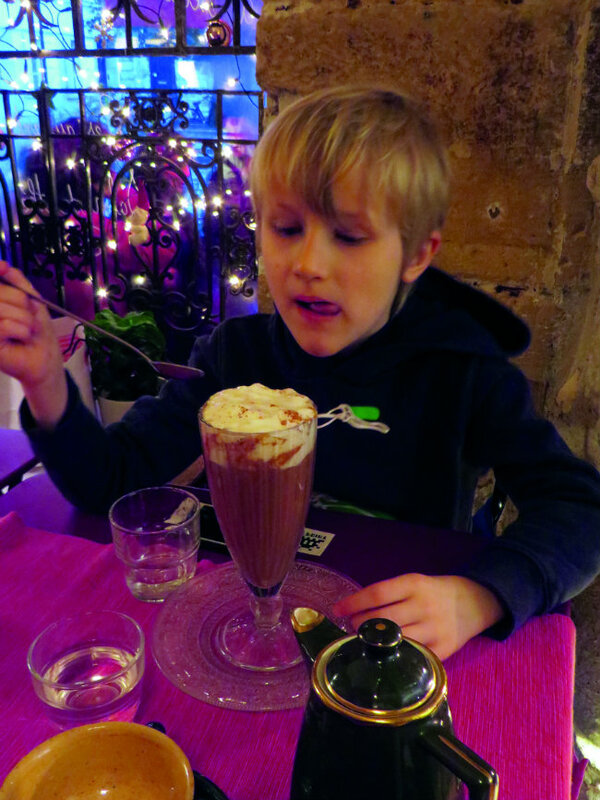 27, to the artisan French wine merchant La Cave Saint-Paul and the vibrant neo-bistro Le Chanard at No. 8. But the fresh air and vitality these new arrivals bring is slightly attenuated by a wary incertitude many share about the neighbourhood’s future. With a multi-year project to eco-renovate the ancient buildings that constitute the Village Saint-Paul scheduled to begin in 2018, many business owners fear a dip in sales looms ahead. And in a neighbourhood that has witnessed a millennium of tumultuous history, every stone seems to offer a reminder of how suddenly a prosperous era can begin or end. After all, rue Saint-Paul’s very name is a reference to a place that was erased from the map. The rue Saint-Paul began as nothing more than a muddy path leading from the banks of the Seine to a cemetery outside Paris. Burying the dead within the city walls was forbidden, in accordance with Roman custom. Around 633, a chapel was erected adjacent to the cemetery dedicated to Saint-Paul. By 1125 that chapel had become the church Saint-Paul-des-Champs, named after the fields that surrounded it. When Charles V fled the pestilence of medieval Paris in 1361, he chose to settle next to this parish, then outside the wall built by Philip Augustus, and named his new residence Hôtel Saint-Pol. It remained a favourite of French kings into the 15th century, then fell into disuse. François I demolished it in the 16th century. was destroyed during the Revolution, but a towering portion of the church’s gable wall remains at the corner of rue Saint-Paul and rue Neuve Saint-Pierre. One may even ‘visit’ the church’s lost bell tower, simply by stepping into the watch boutique Laruze, whose stone walls and sealed medieval door are its vestiges. 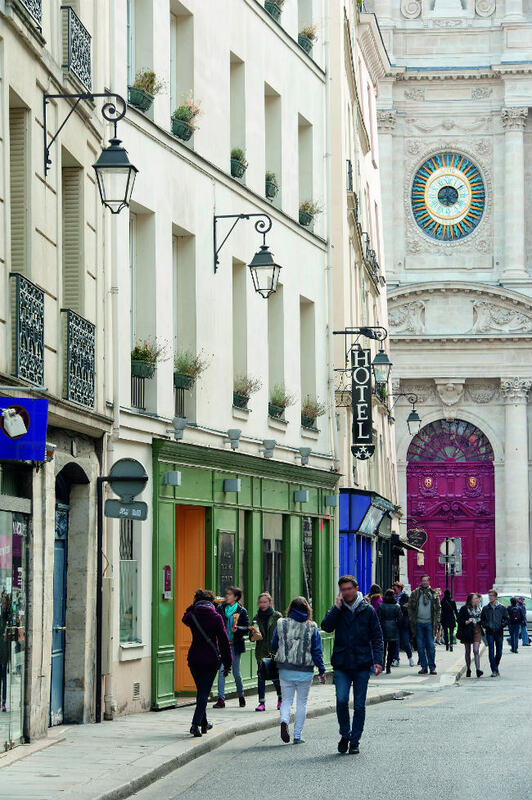 Another remnant is its magnificent, pastel-coloured 1627 clock, which now sits in the façade of Saint-Paul-Saint-Louis on rue Saint Antoine. Yet where these layers of history run deepest is the Village Saint-Paul. 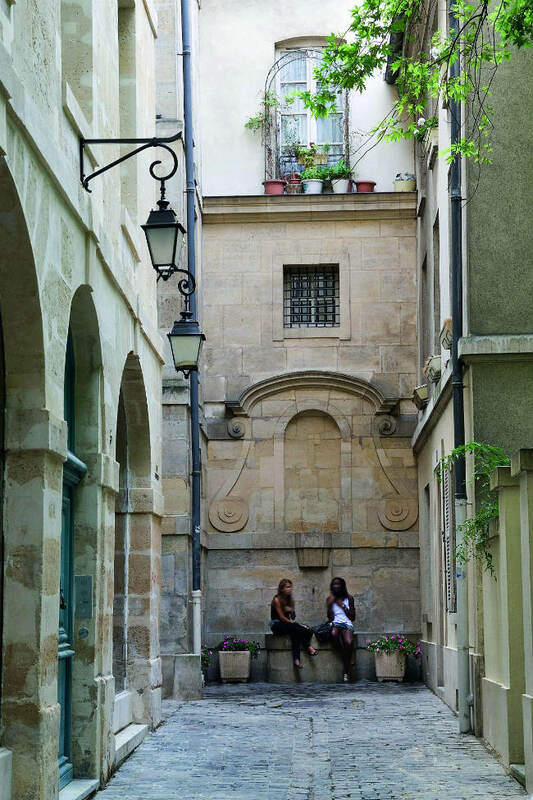 This labyrinth of courtyards and buildings between rue Saint-Paul and rue des Jardins-Saint-Paul was built between the 16th and 19th centuries on land which was once the gardens of the Hôtel Saint-Pol. By the 1930s, this entire western side of rue Saint-Paul had become derelict and disease-ridden, without plumbing or electricity, and was slated for demolition. Yet World War II halted its destruction, and after the war the need for lodging obliged the City to rapidly restore the buildings into apartments. 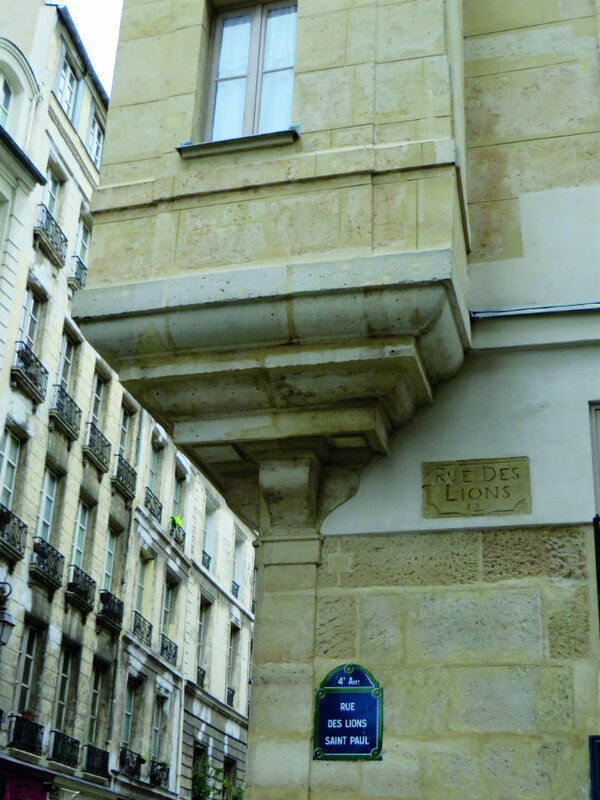 The passing of the Malraux Law in 1962 provided permanent protected heritage status for this and the rest of historic Marais. In the 1970s the City devised a plan to revitalise the village by transforming it into a centre for art and antiques. 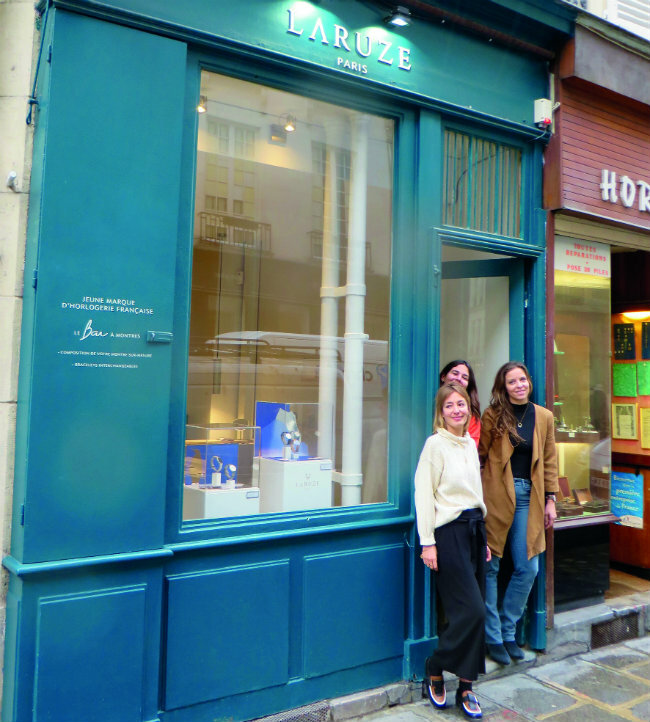 Today, the village is still home to hatmakers, luthiers and ceramic artists, such as Dorothée Hoffmann of Les Céramiques du Marais, 15 rue Saint-Paul, who opened her restoration and creative workshop dedicated to ceramics, terracotta, enamels and glass in 2011. There are also pioneering galleries, like Galerie Hayasaki and Galerie Photo12 at 12 and 14 rue des Jardins-Saint-Paul. And the village boasts experts on antiques from every niche and era; from Monde Secret, 21 rue Saint-Paul, dedicated to Art Deco jewellery, decorative objects and furniture, to Christelle Gonzalo’s Sur le Fil de Paris, 2 rue de l’Ave Maria, a fascinating and dynamic antiquarian bookstore dedicated to Paris through the ages, and Marianne d’Audrey’s Cassiopée, 23-25 rue Saint-Paul, a temple to l’art de la table. 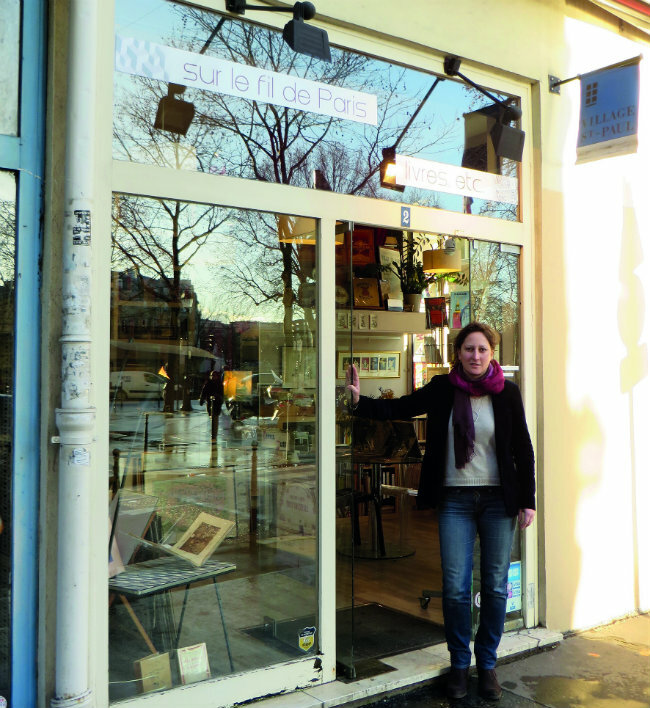 What then does the future hold for the quartier Saint-Paul? 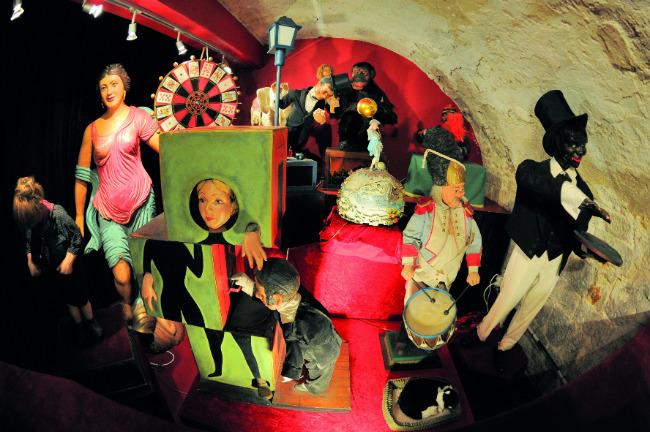 One might seek an answer by walking down the stairs at 11 rue Saint-Paul and stepping underground into the unexpected and fascinating Musée de la Magie, home to one of the world’s biggest collections on the history of magic, all housed in 1,500 square metres of 16th-century cellars directly beneath the Village Saint-Paul. The museum director, Bogdan Murat, isn’t a fortune teller, but hopes the Village will remain a place of opportunity. 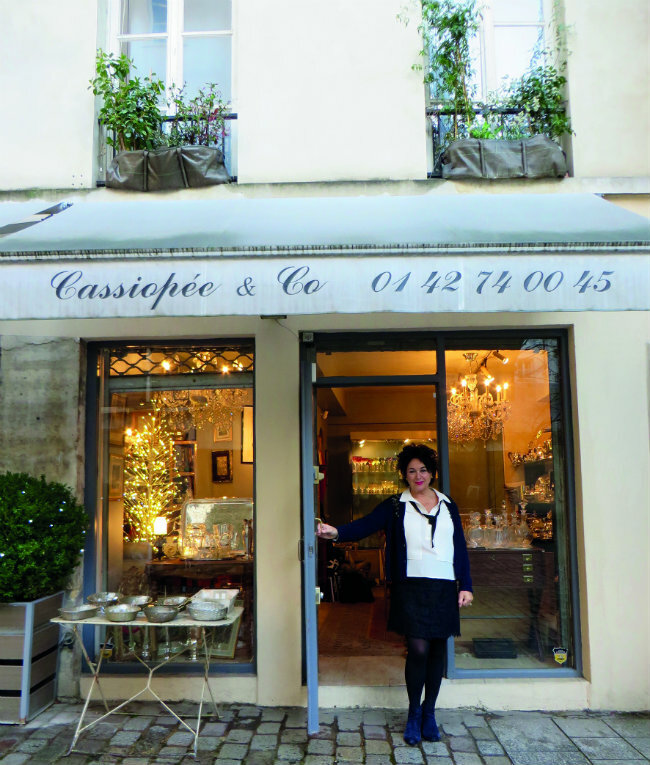 Antiquarian shops can be stuffy and intimidating, but that of Christelle Gonzalo is anything but. Hers is a treasure trove of documents dating back to the 16th century – works of literature, poetry, engravings and maps, but also 19th-century guidebooks, advertising pamphlets, postcards and more. So many captivating threads to follow and discover the rich history of Paris and its people. 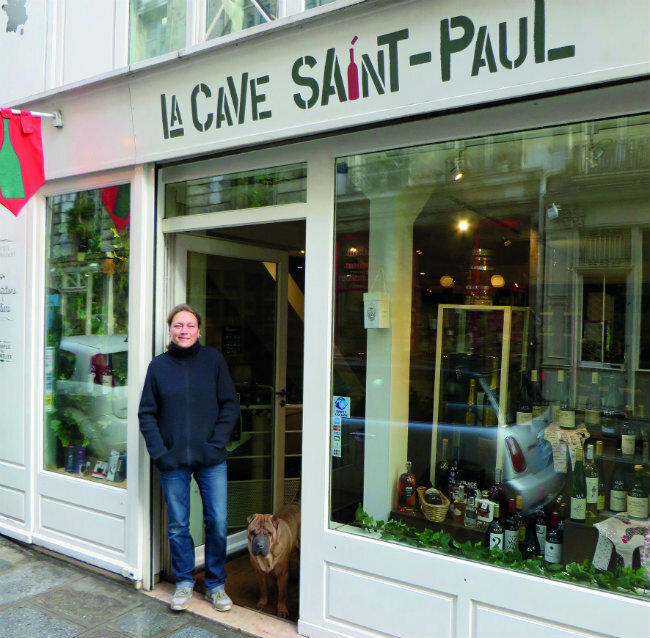 This charming wine shop shines a light on little-known French producers from famous regions. Highlights include the extraordinary organic champagnes of Fabrice Pouillon, the wines of Château Puech-Haut (the “dark horse of Languedoc”) and spirits like vodka Ekiss from the Camargue and the divine, honey-infused cognac liqueur by Domaines Francis Abecassis. 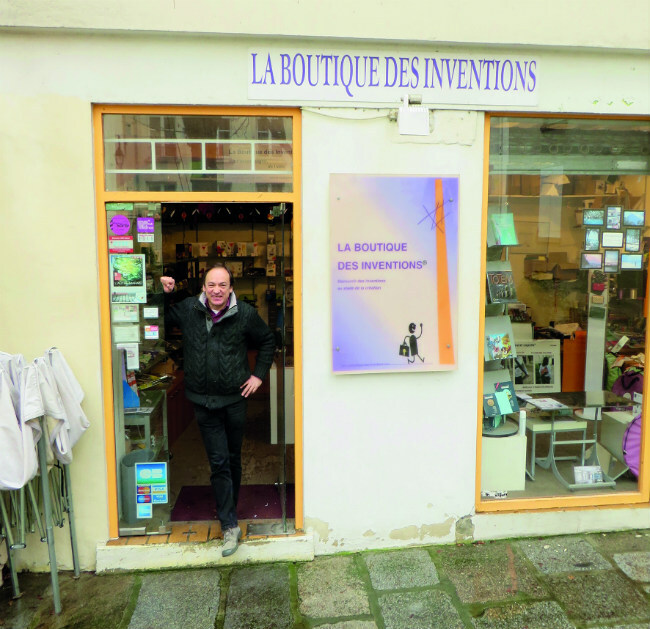 Paul and Isabelle opened their boutique in 2003 to collect the freshly trademarked ideas of French and foreign inventors. Today it is a cornucopia of one-of-a-kind gifts – everything from impossible-to-lose QR-code-equipped doudou soft toys to 24-hour watches by Louis Jeansol, to accident-proof mandolin vegetable slicers. by the greatest names in silver, crystal and porcelain. 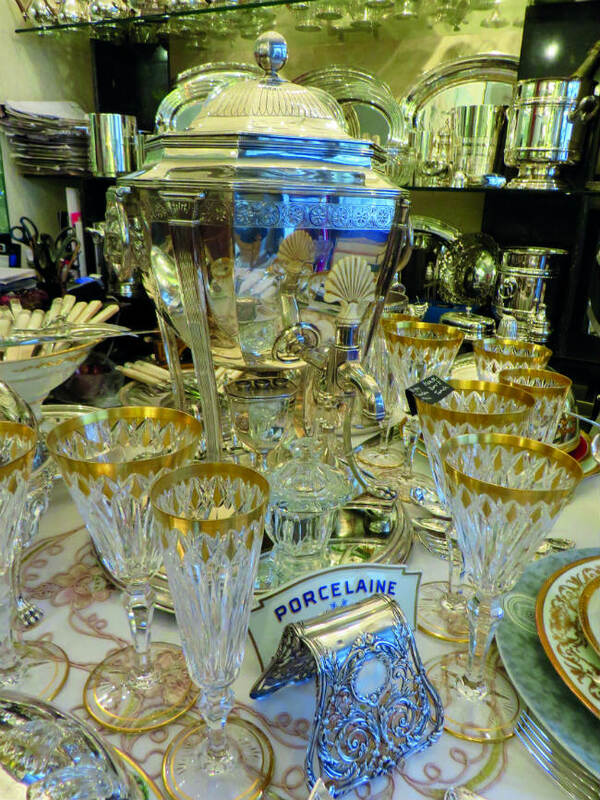 Recent items include 19th-century silver asparagus- and fish-servers, Art Nouveau ice-cream spoons in vermeil, Art Deco wine decanters by Baccarat, Victorian-era samovar tea urns, and even an 1880s roast-beef wagon. Laruze is a young start-up with a new kind of watch, marrying the Made in France savoir-faire of luxury watches and the fast-paced fashion savvy of more affordable foreign brands. At their workshop/ boutique, men and women step up to a ‘watch bar’ to choose from several classic watch designs and an evolving collection of unique and interchangeable straps to create a one-of-a-kind timepiece. 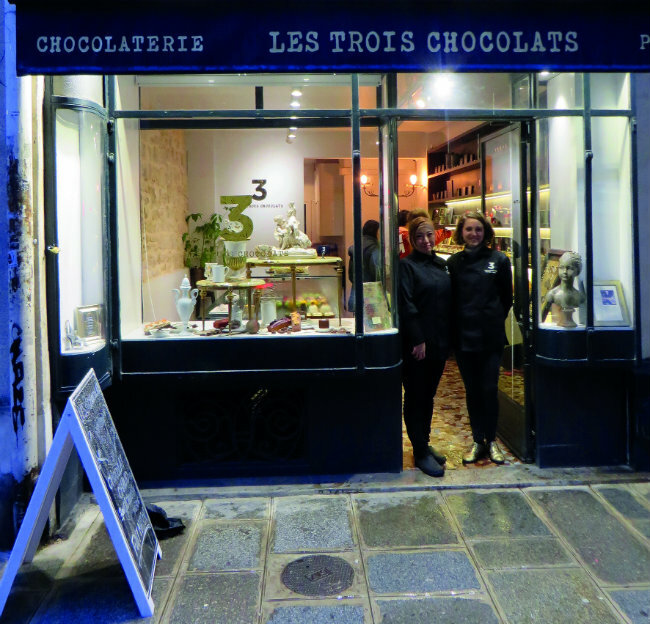 Les Trois Chocolats is the newest chapter in a love story for France and chocolate by three generations of Japanese chocolatiers. 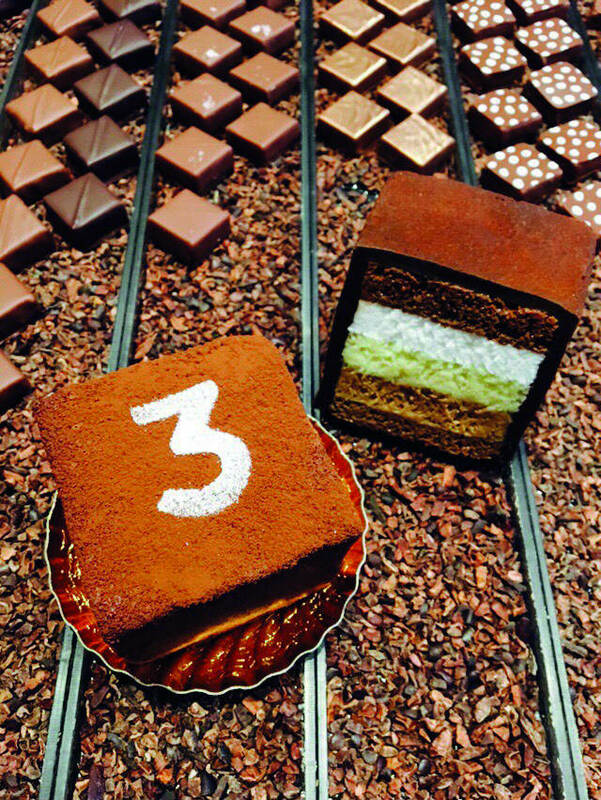 After training with France’s best pastry chefs, Emiko Sano followed her grandfather and father in creating her boutique in 2017, offering chocolates and pastries of exquisite quality, marrying such flavours as yuzu, ginger, sweet roasted soy flour, or matcha tea. In 2015, I visited the Rue Saint-Paul Village shops. It was a charming vibrant area with cafes, many interesting shops and the antique vendors set up in the interior passages on weekends. I visited again last week and was so disappointed to see that many of the shops and cafes are closed and under renovation. The area is mostly deserted although a few nice antique shops remain. I hope someone will be able to save this quaint area and revitalize it! I agree, every year when I visit another shop has closed. It’s such a quaint little area, it’s so sad that it’s not more bustling. When my sister and I visit Paris we always make our way to the Marais area. It is so charming . I hope it doesn’t change too much . I am an inhabitant of the watch tower building shown here. Please do recommend my hidden jewel neighborhood to people who truly love Paris. A treasure not mentioned in this article is the Hotel decSens, a perfect chateau that is a library of art books and is open to the public during specific hours during the fay.